The good news this summer is that Santa Cruz Shakespeare, the new company sprung from the ashes of the defunct Shakespeare Santa Cruz, is here at all. (The old SSC collapsed last year when its primary patron, UC-Santa Cruz, decided – after 32 years – to withdraw support.) The great news is that the new company is not only excellent in and of itself, but demonstrates considerable continuity with its predecessor and perhaps – after a series of events worthy of one of Shakespeare’s romances – what was lost has been found again. 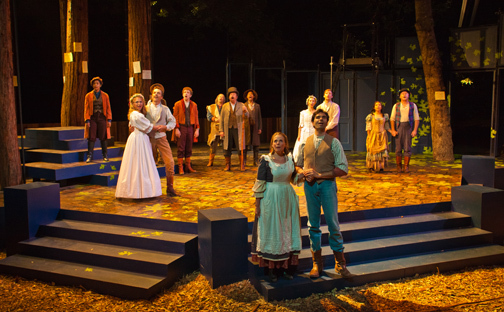 The full cast sing a celebratory hymn in Santa Cruz Shakespeare’s As You Like It. The controversial decision to close Shakespeare Santa Cruz was just one painful effect of the widespread devastation caused by the billion-and-a-half dollar cuts to California’s higher education systems since 2008. This particular loss, however, struck a chord with its loyal audiences, who rallied to save, if not the company itself, the accumulated artistic capital of this beloved summer tradition. Funders in the local community in Santa Cruz and the Bay Area artistic community pulled together to resurrect this acclaimed artistic resource in a new, independent form. In record time a new non-profit was created, an infrastructure was reinvented, and sufficient funding was raised to mount a season. All this is cause for great celebration. It would be churlish to criticize the initial efforts of such an heroic effort for artistic insufficiency, so I (and my critical colleagues, I think) are grateful that no leeway is needed. The two mainstage offerings of the summer (As You Like It and Merry Wives of Windsor) can stand on their own. Conceptually, Merry Wives is the most interesting. Although chosen as a vehicle for Richard Ziman (whose portrait of Falstaff in the Henry IV plays in recent years has made him a local celebrity) the real interest comes from director Kirsten Brandt’s feminist reading and inventive staging set in the 1920s. Merry Wives is a lesser work in the canon. Almost entirely in prose, it looks like a play hastily assembled and perhaps never advanced beyond a first draft. The ‘Merry Wives’ (Julia Coffey and Greta Wohlrabe) fool Falstaff (Richard Ziman) into yet another trick in Santa Cruz Shakespeare’s The Merry Wives of Windsor. The plot is an exceedingly thin and repetitive regurgitation of the famous commedia dell’arte get-in-the-bag lazzi in which an obnoxious man is tricked into hiding is a container “for his own protection” and then beaten by his alleged protectors. In MWW, Falstaff attempts to seduce two different (married) women by sending them identical proposals for assignations on the same day – apparently unaware that they are best friends. The women (repeatedly) pretend to accept and then in slapstick incidents punish the very-slow-to-get-the-picture Falstaff for his unwanted advances, while one also gets in some licks against a suspicious husband. The other gets her own comeuppance from a daughter who ends the play by becoming a wife to the man of her own choosing against the plotting of her mother for a very bad candidate. In most modern productions the play is not very funny, because there are only so many ways a fat joke can be told and Falstaff is much less engaging in this play than he is in the histories. Brandt has launched the gender politics into the foreground, refocusing the play on the titular wives instead of Falstaff. Her leading actresses, Julia Coffey (Mistress Ford) and Greta Wohlrabe (Mistress Page), find the genuine humor in women who are tired of being underestimated and can run circles around the men in their lives. Carly Cioffi (as Mistress Quickly) and Maribel Martinez (as the enterprising daughter, Anne Page) round out the cast of clever women. The director and her cast found astonishing depths in characters that are generally played much more superficially. The male cast was more than capably played – but given the conception of the evening – necessarily seemed more one-dimensional and less engaging. Ziman’s Falstaff was not the centerpiece of the evening, but he gamely took all his slapstick licks and summoned up his dignity at the end. The strongest performance was probably that of Mark Anderson Phillips whose jealous, “mansplaining” Master Ford was delightful. 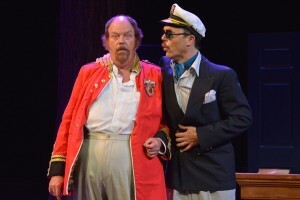 Falstaff (Richard Ziman) is fooled yet again by “Master Brook”- Master Ford (Mark Anderson Phillips) in disguise in Santa Cruz Shakespeare’s The Merry Wives of Windsor. Kit Wilder (the Welsh parson Hugh Evans) and William Elsman (the French Doctor Caius) led the supporting actor contingent with loving charm. The 1920s setting gives the set designer Eric Barker, the costume designer B. Modern, and the lighting designer Kent Dorsey a specific and recognizable period in which to work – and they all find magic in it. B. Modern’s costumes, especially, reflect the perfect expression of women who are finding their freedom in times when men don’t yet “get it.” The best sight gag of the night is, however, Falstaff’s “disguise” as a garish and hugely rotund female fortuneteller. 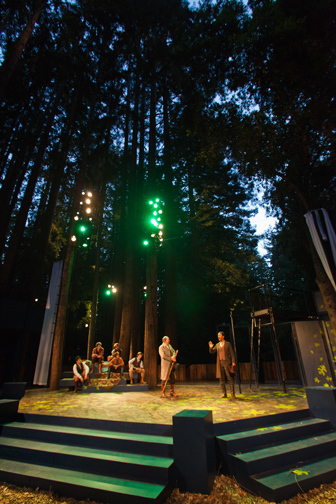 As You Like It was, by contrast, a much more staid and traditional production but situated in probably the most beautiful setting in the world for this play – The Sinsheimer-Stanley Festival Glen, a redwood paradise – it too was delightful. Scenic designer Michael Ganio and lighting designer Kent Dorsey made the most of this natural environment featuring it with spectacular combinations of light and shadow that drew audible gasps from the audience when curtains were drawn that revealed the vista. Duke Senior’s forest court (SCS acting interns), Duke Senior (Richard Ziman) poke fun at the “melancholy” Jaques (Allen Gilmore) in Santa Cruz Shakespeare’s As You Like It. 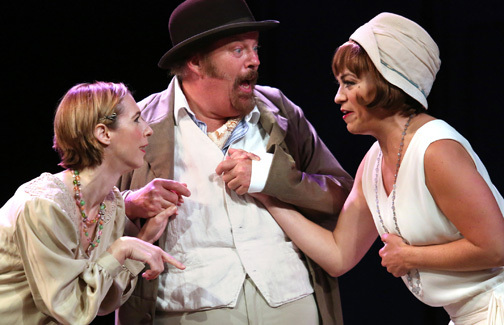 Using a repertory cast for the summer, AYLI utilized the same personnel as Merry Wives, but often to vastly different effect. Julia Coffey, who proved such an excellent farceur as Mistress Ford, here expertly plays the much more emotionally complex leading woman, Rosalind. The contrast could not be higher, not least because she spends most of this play in convincing disguise as a young man. She is in the woods because she has been banished by her usurping uncle, Duke Frederick. She flees to the forest with her cousin Celia, disguising herself as protection against outlaws. If there are any such ruffians, however, we never see them. The forest is occupied by her father (the overthrown Duke) and his orderly, nostalgic courtiers. A recent arrival is a young nobleman, Orlando, who is also fleeing an inhospitable home, in his case running from a treacherous older brother. Rosalind and Orlando have met before, when he unexpectedly won a wresting match with her in the audience, at which they fell for each other immediately. In this production Dan Flapper places the emphasis on Orlando as both extremely inarticulate and overly romantic. When the couple again meets in the woods, Rosalind has already assumed her male alter ego, Ganymede, which allows her to covertly tackle the problem that his worshipful and idealized courtship (he is posting bad love poems on trees) is less engaged than what she has in mind. She undertakes to disabuse him of his poetic attitudes through “love lessons,” her male self impersonating her actual self in a series of scenes of dizzying complexity. Rosalind playing her alter ego Ganymede (Julia Coffey) schools the love sick Orlando (Dan Flapper) in the ways of wooing in Santa Cruz Shakespeare’s As You Like It. Photo by Jana Marcus. Flapper and Coffey have outstanding chemistry as the central couple. The courtship is less engaging that it is in some productions because Flapper’s Orlando never loses sight of the fact that these “love lessons” are just pretense and his real love is, he believes, elsewhere. (I read the play to suggest that Orlando finds himself developing very real feelings for Ganymede, which he neither understands nor controls.) In Mark Rucker’s production, however, it is Rosalind who loses sight of the game, kissing Orlando in an inappropriate moment from which he recoils. Still, the sparks are no less intense for this reversal. Greta Wohlrabe plays Rosalind’s cousin Celia, and it is fascinating to see her paired with Mark Anderson Phillips playing Orlando’s repenting older brother Oliver. (In Merry Wives, they played Mistress Page and Master Ford, respectively.) Here, their chemistry rivals that of the main couple and their giddy humor becomes infectious. Co-artistic director Mike Ryan plays the court jester, Toucstone, settling into country life with clarity and precision. It is a very difficult role, composed mostly of indecipherable old jokes, but he makes us understand. By far the most original touch in the production was that Orlando’s faithful old retainer, Adam, (played by Marcus Cato) was given a prominent – and interpolated – death scene just before intermission. It was a darkness that would not return, however. Understandably, this summer the focus is on the miracle of the phoenix, and not on what is lost. 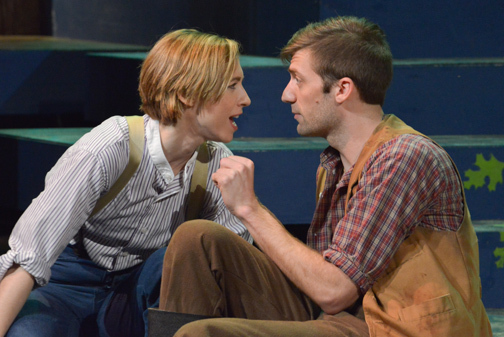 You are currently reading What Was Lost is Found – A Review of the Santa Cruz Shakespeare Season at Shakespeare's Tribe.